I've had a grueling itinerary for the last few weeks, and most days I can't remember where I woke up in the morning. When I finally reached the Caribbean coast in a smallish town called Río Caribe, I just wanted to melt and be rebuilt, but without ankles adorned with itchy bug bites, the glowing Rudolph nose and the two outfits perpetually crusted with dried sweat. After a moment of catatonia in a posada hammock, I pried myself away at sunset to do a quick recon of the beach promenade. Most towns I've visited tend to lock up and head home by dark, but there was salsa pulsing from the oceanside plaza and a few dozen people jumping around in spandex pants and dampened t-shirts. 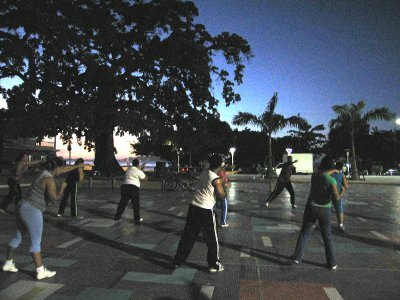 I chatted up two women sitting nearby, who explained that the local government sponsored a nightly exercise class, and they encouraged me to participate. Raise your hand if the last aerobics class you took was in the 80s. But I plopped down my daypack and joined the back row. There seem to be hunky Cubanos working everywhere in Venezuela, and naturally, the rubber band leading the class was one too. Though I went limp after half an hour, the locals - mostly women, plus one very energetic toddler - continued on, doing nonstop drills in the tropics without the benefit of air conditioning. If you've done any traveling in the developing world, you probably have a contribution to what I call the motorbike chronicles - the extreme and incredulous sightings of ingenuity mixed with cheap personal transportation. Like a family of four pressed like panini onto a moped, with a 1-year-old dangling off the front and a month's worth of rice bulging over the rear fender. Today I witnessed my favorite so far: while holding on with one hand, a passenger balanced a partially sliced sheet cake in the other. The hot pink dessert must have been the size of a large pizza. I watched the bike jostle over potholes and through a low rain trench, but it looked like they had it down. Wow. I must have been sending out special motorcycle signals to the universe. After asking for directions in a shop a bit later, one of the gray-haired men I'd spoken to had second thoughts about the quality of his instructions and tracked me down a block away to give me a quick lift on his motorcycle.